Long ago, in a galaxy far away, I was in high school. It was a mediocre public school in Lancaster County, Pennsylvania where there was a holiday for the first day of deer hunting season, but not for Martin Luther King Day. This is, however, where I met Mr. Paul R. Barber, my own Jedi master. Mr. Barber died this month, so this column is in his honor. Having lived in the Midwest and visited Texas, Missouri, and Oklahoma, I can tell you that Lancaster County trumps all of them with Bible-belt influence. Some people consider that a good thing, I am not one of them. The predominant Biblical interpretation for this region is literal, which strips Christianity of the rich potential of metaphor. It was in this environment that Mr. Barber volunteered to teach world religions. He was a devout, practicing Roman Catholic, but when he taught Hinduism, he became a Hindu. He was so effective that invariably the Biblical fanatics in class – and there were always several of them – would barrage him with angry arguments. They expected his approach to teaching non-Christian religions would be to offer up what was wrong with them. Living where I did, I think I understand what it was like for Luke Skywalker on the desert, trying to farm, when he finally met Obi-Wan Kenobi (Episode IV: A New Hope, the first movie produced), who would become his own Jedi master. With Mr. Barber, I took an independent study in philosophy where he introduced me to the likes of existentialism and pragmatism, while also letting me read Jonathan Livingston Seagull and showing me how to find philosophy in popular culture and simplistic books. At the time of this writing, All Things Religious is up to about 6,500 views. I recognize that CNN gets that many hits in 15 minutes, but think about how long it would take the majority of clergy persons whose average Sunday audience is 70, to be able to say their sermons were heard 6,500 times. I would not have taken this path without Mr. Barber. The values and mythology of Star Wars was not accidental. Lucas told “American Masters” (PBS): “There was no modern mythology to give kids a sense of values, to give them a strong mythological fantasy life…Nothing was being done for young people with real psychological underpinnings.” Lucas said that he set out to write a “modern fairy tale” for children and was greatly influenced by mythology scholar, Joseph Campbell (substantiating YouTube link follows). Joseph Campbell warned us (“The Power of the Myth,” with Bill Moyers, PBS) that without mythology, society starts to fall apart. If you would challenge that, then observe the shocking and ever-increasing incidents of random shootings. It is possible that a secular culture, like Lucas created in Star Wars, can still share stories, fantasies and a value system. The Galactic Republic of Star Wars was the democratic union that governed the galaxy of many races and species in peace for a thousand years with the Jedi Order as guardians of peace and justice. Then slowly and surreptitiously, the (evil) Empire rose to destroy democracy to the benefit of the few. Their challenge was all the easier in a culture that had succumb to corruption and bureaucratic inertia. The Jedi Knights were the spiritual sort in the galaxy who trained and self-governed with telepathy, insight, and wisdom. I see them as conscience police. When bad things happened, it was good to call a Jedi to investigate and defend. They were armed with lightsabers which were more for defense than offense and had both power and grace. 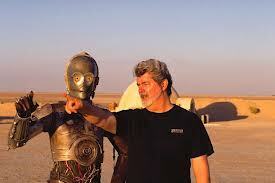 Lucas mixed the temporal and the meta-physical by introducing the “Force” and the midi-chlorians. For help on this, I found a site that calls itself “Wookieepedia,” the Wiki for Star Wars. (Don’t know how good it is but it the name makes me smile.) It convincingly described the Force as “a pervasive energy field.” It’s a little more than that because it seems to have a “will” for the creatures of the galaxy. To help interpret that will, there are the microscopic midi-chlorians which are present to varying degrees in different species, highest of course in the Jedi. At this point I remind you that the creator of the Star Wars phenomena – for it is a great deal more than six movies, set out to tell stories to children. The movies have all been extremely successful. There are Web sites, games, toys, Halloween costumes and products that seem to reach to the stars. One year for Halloween I was a Jedi Knight and my little dog was Yoda. Some silly neighborhood kid came as Darth Vader and was freaked out when I drew my lightsaber on him. Well, what was he expecting? I’ve got your lightsaber now, kid. I propose that Star Wars is more than entertainment and Joseph Campbell was right. The attraction to those stories speaks to our natural desire for myths that serve our time. Curiosity about the metaphysical is natural. A common morality is essential. As a global community, we have to stand outside our own traditions to recognize our common values. I don’t see how we can survive otherwise. I challenge you to present me with a culture that doesn’t value justice, for example, though of course not as much agreement on how it is defined. Or view from the reverse perspective; examine what’s behind those trying to impose micro-ethics on others. I predict you will see a desire to control, oppress, or subjugate someone who is different, and it is often fear-based. Thank you Jedi Master Paul Barber. May the Force be with you. –J.B.